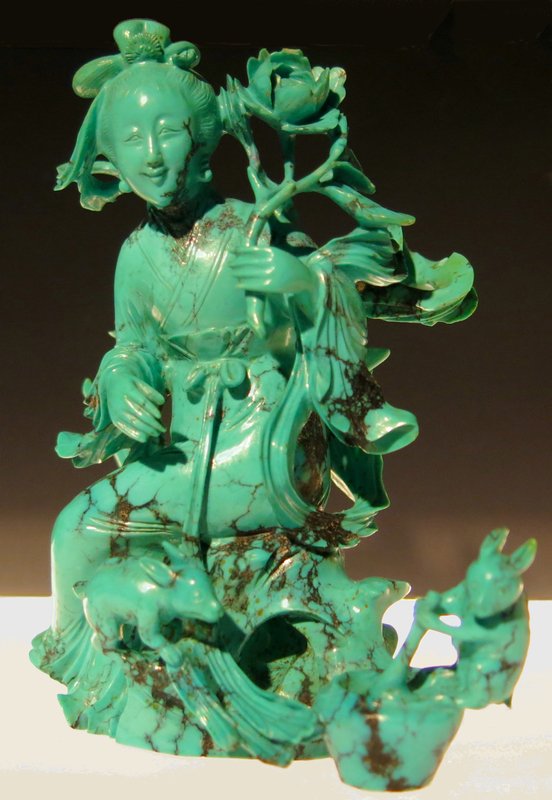 On a recent visit to the Asian Art Museum, I saw a beautiful mixed media sculpture of the Virgin Mary. The body of the sculpture was made of wood, the head and hands of ivory, a crown of stars of metal, and the hair of actual human hair. When Westerners think of Asian religious art, they tend to think of Buddhas and Ganeshas and Guan Yins, forgetting that Christianity has had a presence in Asia for more than 1900 years. So of course there are Asian Christs and Asian Marys. This Virgin Mary was made in the Philippines, to whence Christianity was brought by European Christians about five hundred years ago. The sculpture cannot be precisely dated, but was made sometime between 1650 and 1800. Anyone familiar with European Christian art from the Middle Ages and the Renaissance will recognize the iconography of Mary standing on a crescent moon. But some of the details feel Asian. Mary’s facial features do not look stereotypically European, and according to the wall label next to the sculpture, “Early Spanish reports describe artists of Chinese descent as well as Filipino artists carving these images in the Philippines.” The treatment of the draped fabric feels non-European to me, especially Mary’s blue robe, which takes on a life of its own in a way that European Renaissance sculptures, based on classical models, never do; it feels more like the flowing, moving fabric found on some Chinese sculptures, or even on some Medieval European sculptures. I particularly like the use of human hair, a material that anchors Mary in the human realm, and keeps her from drifting into a realm of inaccessible transcendence. In short, here is a deity that incorporates European iconography with Asian forms and sculptural traditions; she is a globalized deity who also links the human to the transcendent realms. “Although the ionospheric effects of solar eclipses have been studied for over 50 years, many unanswered questions remain,” according to HamSci.com, organizers of citizen science experiments designed to test the propagation of radio signals during the eclipse. I was not set up to actually participate in the citizen science experiments organized by HamSci.com, but I turned on one of my amateur radio transceivers to monitor high frequency transmissions during the eclipse; specifically, I monitored PSK-31 transmissions centered on 14.070 MHz, where I knew there would be a lot of activity. Propagation was good before the eclipse started; at about 9 a.m. there was a fair amount of activity on 14.070 MHz, and I was receiving stations as far away as Colorado. As the eclipse progressed, I received fewer and fewer transmissions, and by about 10:20 (when the eclipse was at its maximum here in San Mateo), there were almost no readable transmissions. By now, the band is more active, although the stations I’m hearing are all on the West Coast. My observations were completely unscientific, and it will be interesting to see what comes out of the data that the folks at HamSci.com are gathering during this eclipse. 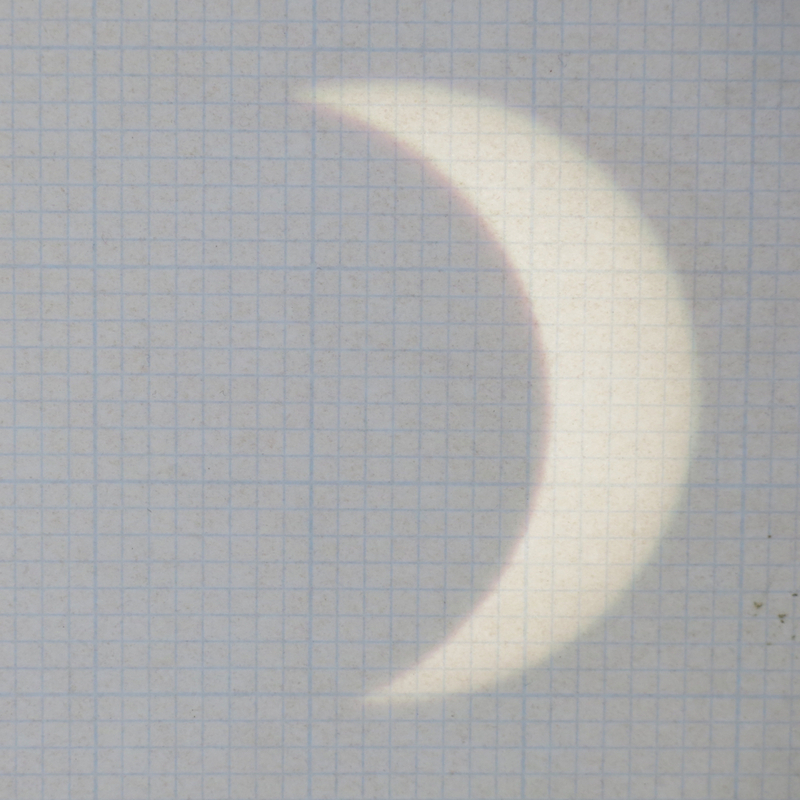 My plan was to project an image of the sun through binoculars mounted on a tripod. The sky was covered by stratus clouds (high fog) at 9 a.m., but by 9:45 the clouds began to break up and Carol and I got a few views of the moon’s shadow slowly moving over the sun’s disk. It became mostly clear by 10:20, in time for the maximum. Then it stayed clear, and I was able to watch the moon’s shadow slowly slide away from the sun. One of the benefits of projecting the eclipse is that I could see the rotation of the earth as the projected image slowly moved as the sun changed its relative position in the sky. This was a good reminder that an eclipse involves relative movement of three astronomical bodies: sun, moon, and earth. And if I had had access to better optics, I could have projected a larger image and watched the movement of sunspots as well. At about 10:20, when the eclipse was at its greatest extent, it was noticeably dimmer than it should have been. The light was about as bright as it would be around sunset — the difference being that the sun was high in the sky, so the shadows were short. It definitely felt a little eerie. But mostly what I felt was a sense of wonder. 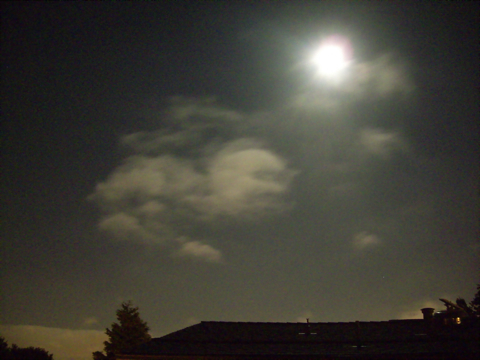 This was the most astronomical fun I’ve had since watching the transit of Venus a few years ago. The rising of the full moon pulls us away from the mundane world of traffic and pollution and politics, drawing us up into a different place: the world of Chang-O and the Rabbit in the Moon; the world of the Apollo moon landings; no, different than both these things. Something primal, something that draws our eyes up at the time of the full moon, even though any mention of the moon is trite, as trite as poems that rhyme June and Moon. 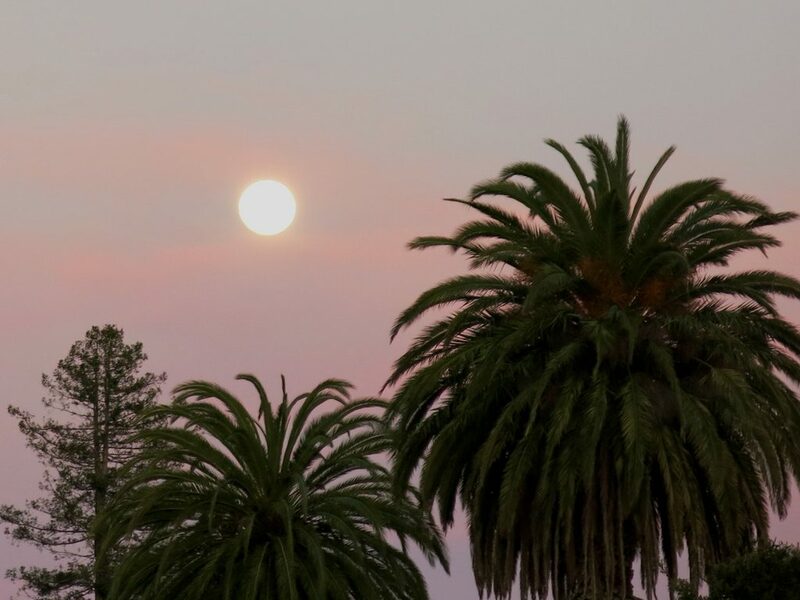 I still can’t believe that I live in the northern California subrubs, where I can see the full moon rising up over both palm trees and redwood trees at the same time. I want to pretend to be bored, but I am never bored by the rising moon. It is always new, always a wonder. More and more, I’m coming to believe that if organized religion is going to help fix global climate weirdness, we have to get out of our buildings more. Not that we should get rid of our buildings — we need our indoor spaces to accommodate a wide range of human person, including elders. But we also need to do more outdoor ministries. Last night, group of youth spent the night at the Black Mountain trail camp, in Santa Cruz Mountains behind Silicon Valley. The hike in is two miles, with a total elevation gain of about 500 feet. We got to the camp, set some tents and made dinner. 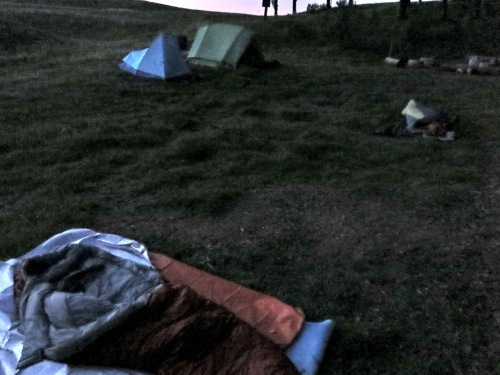 After dark, some of us took a quick walk up to the summit of Black Mountain (elev. 2,800 ft.) and looked down at the bright lights of San Jose and Silicon Valley on one side, and the mysterious fog creeping up the valley on the other side of the Santa Cruz Mountains. Come to think of it, that image could serve as a metaphor for the role of organized religion in understanding humans’ place in the universe: if we wanted it to, organized religion could be the metaphorical high point where we could see both human-centered life on one side, and non-human-centered life on the other side. Dawn from the top of Black Mountain was beautiful: orange sky at the horizon and pink clouds above. After a breakfast of bacon hot chocolate, and more bacon, we hiked out, and were back in Silicon Valley by about ten. It was a short trip, but short trips fit in well with the busy schedules of our teens. *Thanks to E and Eric for the correction. Another in a series of stories for liberal religious kids. This story, from an extinct language group in Southern Africa, offers an explanation for the beginnings of death. The original language this story was told in was the |Xam language, which is now extinct. The people who spoke this language are part of a larger ethnic group commonly referred to as “Bushmen”; in academic circles, the term “San” is used. Both names may have pejorative connotations for the people to whom they refer; I have chosen to use the academic term. “Star, O Star, yonder in the sky! Take my face there. You shall give me my face there. We no longer saw you, and then you came again. Take my face that I may resemble you. You always return, alive again, after we lose sight of you. It was the hare that told you that you should do this. I was coming back from a long walk down the beach to see if there were any Piping Plovers nesting at Goosefare Brook, looking down at my feet in the fading light to see if there were any interesting shells or stones worth picking up. Ahead of me, a man was aiming a camera with a large telephoto lens on a tripod at something. I looked in the direction his camera was pointed, and there was the moon rising up out of the Atlantic Ocean. 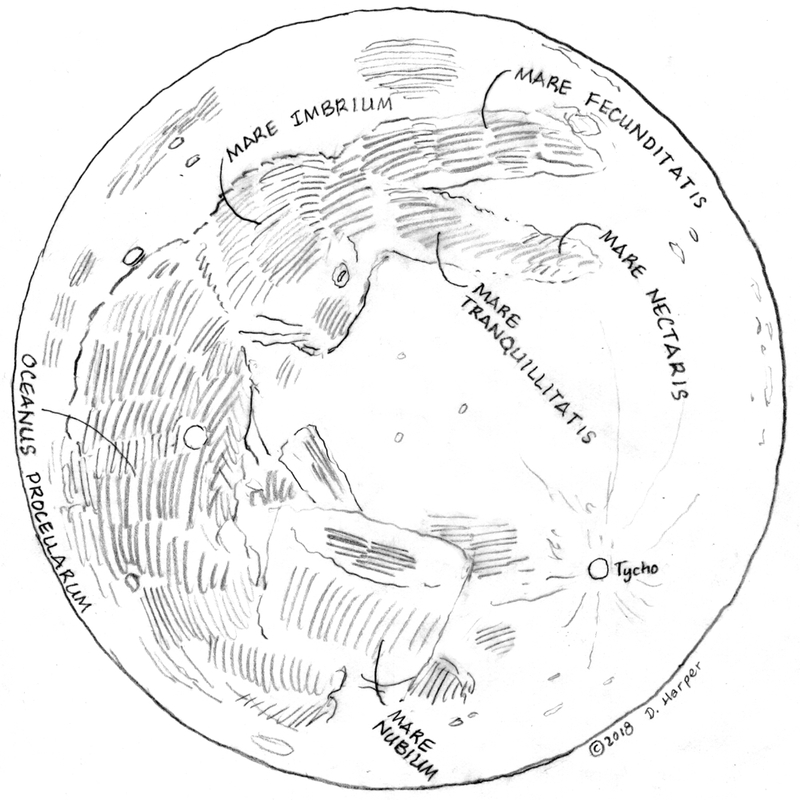 If the moon is about 30 arcminutes wide, it was about 90 arcminutes above the surface of the ocean when I first looked. It was pink and a little brighter than the medium blue sky; it hung just above a distant line of darker blue clouds tipped with pink along their tops. The moon sat in the sky above the gap between Eagle Island and Wood Island. As I walked on down the beach, past the man struggling to aim his camera, the moon appeared to move towards Wood Island, until it stood over the eastern end of the island. The last light of the sun lit up the distant white tower of Wood Island lighthouse; a long shimmering reflection of the moon shone in the waters of the bay. A couple of hours later, I was on the beach with forty or fifty other people for a bridging ceremony for this year’s high school seniors in the youth program at the Ferry Beach religious education conference; these were youth I had watched grow up summer after summer; one of them was the daughter of someone who had been in my own high school youth group. The moon was high in the sky; a long white reflection of it brightened up the calm bay; it was almost bright enough to read by. The air was cool enough to require a jacket and to keep the mosquitoes away, and two foot waves crashed regularly on the beach below us. What a perfect night, said the person next to me.